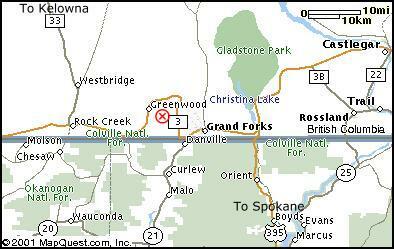 The Phoenix cross country trail system is located 20 minutes west of Grand Forks. With over 17 kms of trails, Phoenix has something for every skier. Located on top of Phoenix mountain, our trails offer spectacular views of the Boundary Country. Use the index on the left to look around. Latest trail conditions: Lots of snow, most trails groomed. To reach the trails from Grand Forks, drive west on highway #3 for 20 kms where you turn left on the Phoenix road. Follow the road up the mountain for 12 kms and turn right at the Cenotaph. Note* - At the 5.5 km mark of the Phoenix road you will come to the turn off for the Alpine ski hill. Stay straight to reach the cross country area. To reach the trails from Greenwood, drive up Phoenix road for 9.5 kms until you reach the Cenotaph and turn left to the cross country ski area.